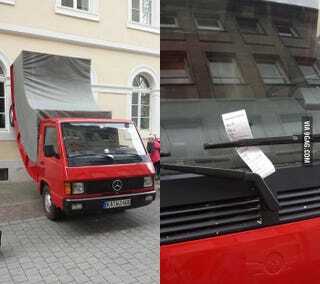 In Germany even Art Installations get Parking Tickets! This Mercedes truck “parked” outside a museum for modern art in Karlsruhe, got a parking ticket. Of course, this got a lot of attention via the internet. Now the authorities state that it was all a joke, and that the ticket got deleted immediately. Not so sure about that.